I won’t lie, we have a pretty fab pantry. At least the size of it is pretty fab, though I’m not a fan of the wire shelving. After living here 6 months though, I’ve kinda started to figure out what works for me in this house and what annoys me. 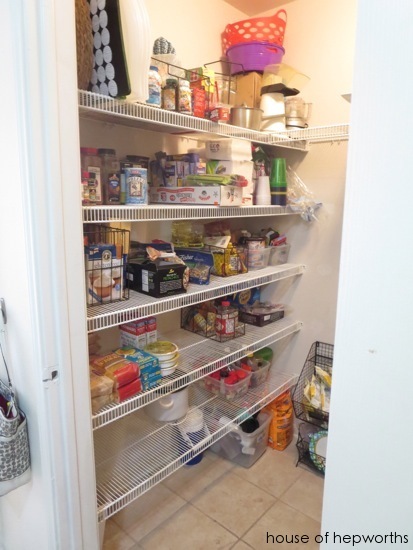 What annoys me about this pantry are 1) it’s not technically in the kitchen, which means I have to walk farther (I can’t fix this issue though), 2) the wire shelves are obnoxious (I can and will handle that issue in the future, but it’s not high on the priority list), and 3) The rear left and right corners are like dark abysses where food goes to hide and then expire (which I can take care of right now). 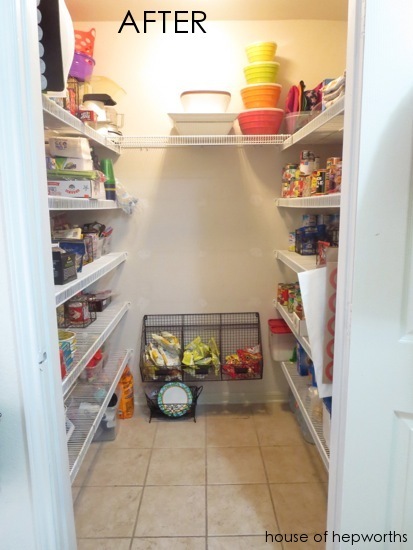 I spent about an hour and a half last week tweaking the pantry to better suite my needs. Basically, I removed all those shelves that are in the rear of the pantry. Seriously, so much better. Yes, I have less space to put stuff, but now I can actually reach all the food, so it feels like I have more space. I may even hang some spice racks along the back wall to create more storage. 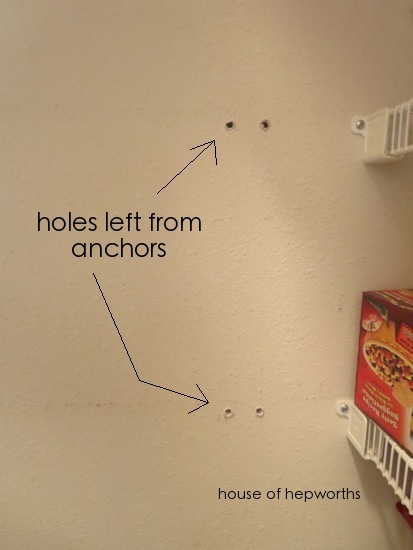 When I removed all the shelves I was left with huge holes from all the shelf anchors. They were too big to just fill with spackle, so I did a little awesome trick that I thought you’d like to know about. First off, you can’t fill holes if they aren’t flush with the wall. Well, I suppose you could, but it would look like crap. 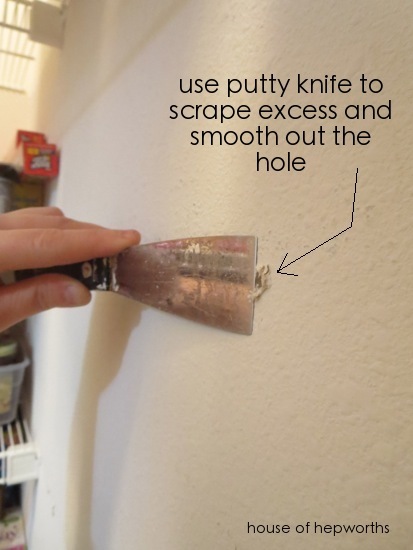 And I prefer my home look nice, so I just took my putty knife and scraped each hole flat. See how the surface is smooth and flat now? This will make for a more professional putty job. It took no time at all to scrape each hole, so just go ahead and do it, m-kay?! Now, for my trick. I’m sure I read about it on a blog at some point in my life, but I honestly have no idea where I got this tip from. The more I think about it the more I think I learned it on HGTV or something. 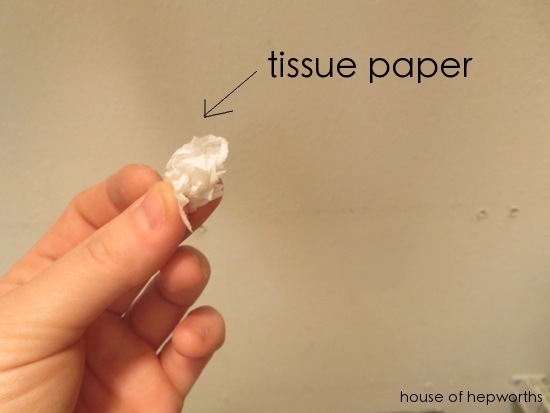 Take some tissue paper, smooch it into a ball, and stuff it into the hole you need to fill. 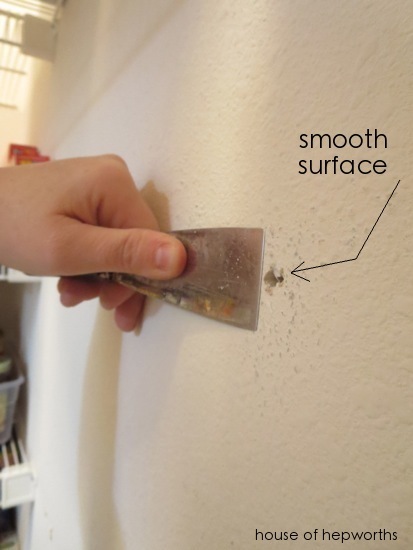 This will give your spackle something to grab onto so the spackle doesn’t just fall through the hole and into the space behind the wall. 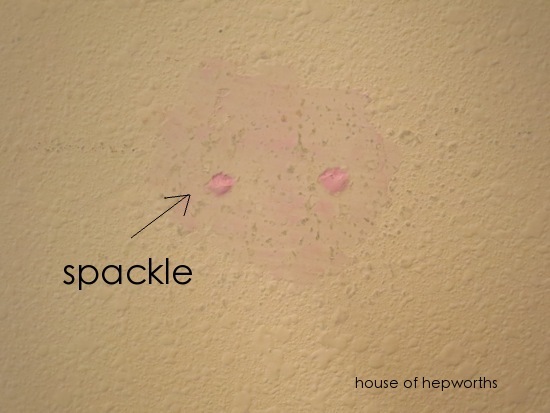 After that, simply spackle as usual. Easy and effective. Final result? More open and a lot easier to find our food. It’s not perfectly organized (I’ve never claimed to have a blog about organizing! ), but at least for today it is clean and I can find what I’m looking for. And I swear, when I put a level on the black wire shelf hanging on the back wall it says it’s level. It sure doesn’t look like it to me though. Maybe the shelf itself is wonky. I’m going to have to investigate. 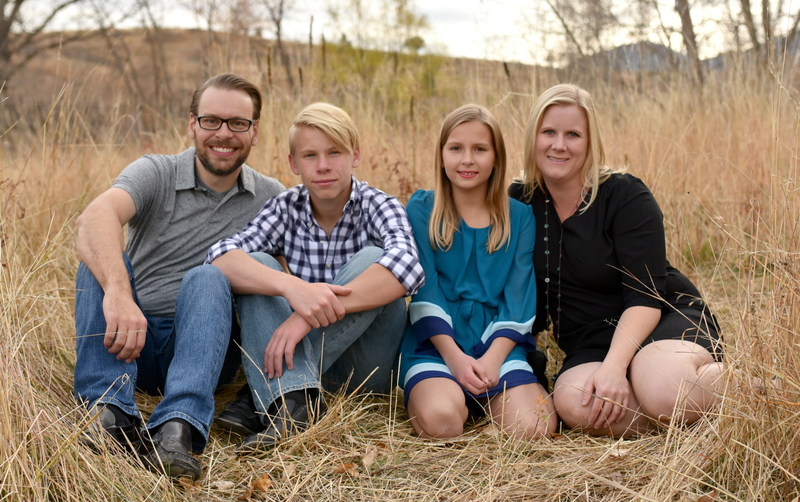 B-T-dubbs, the little organizer holds chips for school lunches. ‘Could’ve used the tissue paper trick when I removed my wall-mounted upholstered headboard and moved apartments! ugh! Great job! Sometimes less IS more. That looks so much more organized. 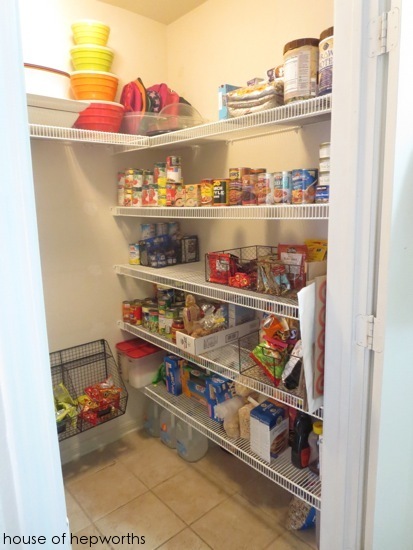 Your pantry makes me jealous! I only have a little cabinet (http://casamarcelli.com/2013/03/29/in-the-kitchen-with-casa-marcelli/) though having drawers makes it way better. Looks great! I agree about the wire shelves, I like to stack and use every square inch ( my husband refers to it as overloading). I lined some of my shelves with cardboard from the large cereal boxes and it works much better. Super clever! 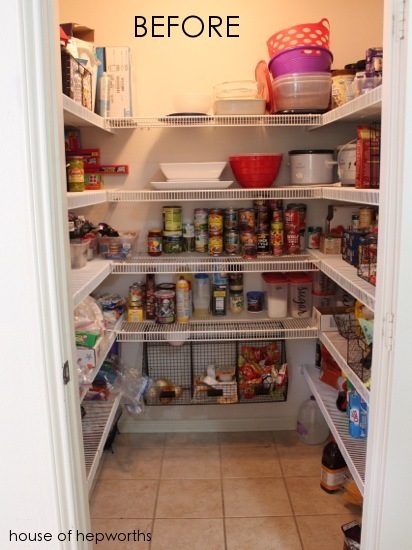 I have an “L” shaped pantry, and wish I could do something about that black hole….and I agree about the wire shelves. Ugh. But they are easy enough to wipe clean if the balsamic drips…. I’m sure you’ll get lots of comments like mine—-I’d love to have a pantry this size!! So jealous! I must remember the tissue paper trick. Brilliant! Love the idea of hanging a spice rack on the back wall! Or aprons or something!